Review: I bought this for a 3 week trip to Europe. It has good storage and I was able to fit what I needed, especially using packing cubes. While well made, the suitcase is heavier than I thought it would be—although only about 3 pounds more, it made a difference. The handle is too short and my new carryon, which is longer but fits under the seat, did not work. Attached by the hook, the wheels touched the ground. Placed over the handle, I didn’t have enough handle to comfortably hold on and drag it. Review: Very well made; worth the little extra weight over the consumer model. Sturdy handle, solid frame, zippers are strong, tough material. I like a rollaboard more than a spinner: spinners run away on an incline; you can much faster with a rollaboard when you're rush in a crowded airport. Comes with the hook for a backpack/carryon. Review: I was looking for a bag a bit larger than my carryon but smaller than the larger bag I have. This is perfect and easy to wheel around. Just what I had in mind. Review: I have been using the 22" version for a couple of years. Needed something bigger to accommodate packing needs for longer trips and winter time trips (to fit knee high boots and heavier sweaterss). Thought it would be a bigger version of the 22", but there are a few differences. Cannot lock two of the three external pockets. Back pocket does not expand. Quality is up to the same Travelpro standards I have found in past purchases over a span of 20 years. I would buy this product and brand again! Review: Purchased (2) of these for my wife and I on a 10-day trip to Scotland. Bag is well made, has a good handle, and rolls very well. We traveled with my cousin and her husband. We changed hotels in Edinburgh and new hotel was 3 blocks away. These rolled very easily through the streets (including cobblestone). My cousin's 4-wheel bag (other brand) lost a wheel during the 3-block trek to new hotel. I'm glad I purchased a high-quality 2-wheeled bag, instead. Fully loaded this bag was 42-pounds. Under the 50-lb. international weight limit and overall size under limits too--which means no oversized or overweight baggage charges from airline which can be $300 or more per bag! Pros: Most importanly - its size: bigger than a carry-on, but still easy to handle. Durability. Price. Review: This 24" 2-wheeled rollaboard is absolutely superb for intermediate length travel. 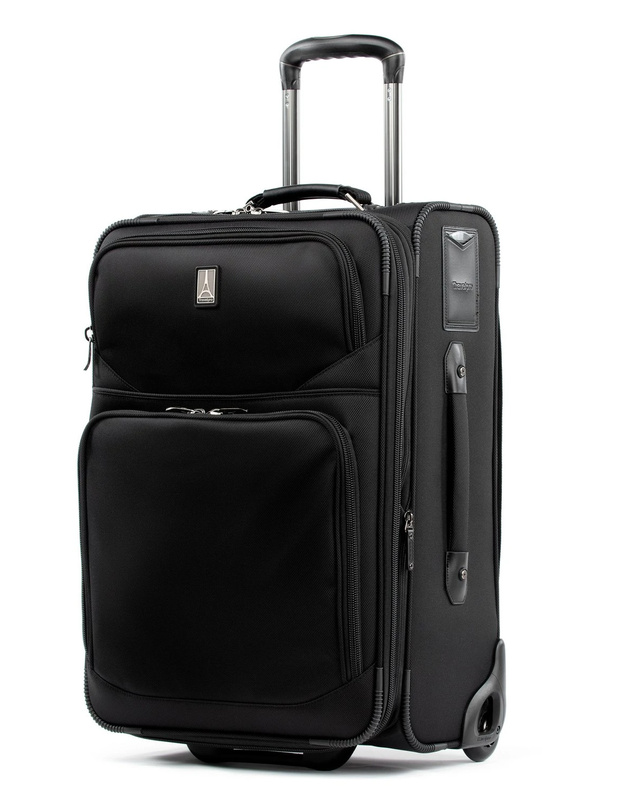 Unlike most 24-25" luggage, this rollaboard is reasonably sized at 24x16x9.5", yet it easily holds enough stuff for 3-5 weeks of comfortable travel (without even using its 2" expansion capability). It is very well-built, and easy to handle in all situations. Unlike a spinner, it is right at home on even the most rugged of French cobblestones - which is where all good luggage loves to go! The zippers on the FlightCrew 5 are top knotch, and the size and locations of its various pockets are perfect. You will not find a better, reasonably-sized 24" rollaboard in the market today. Cons: The weight and handle length. Cons: If fashion is important to you, look elsewhere. 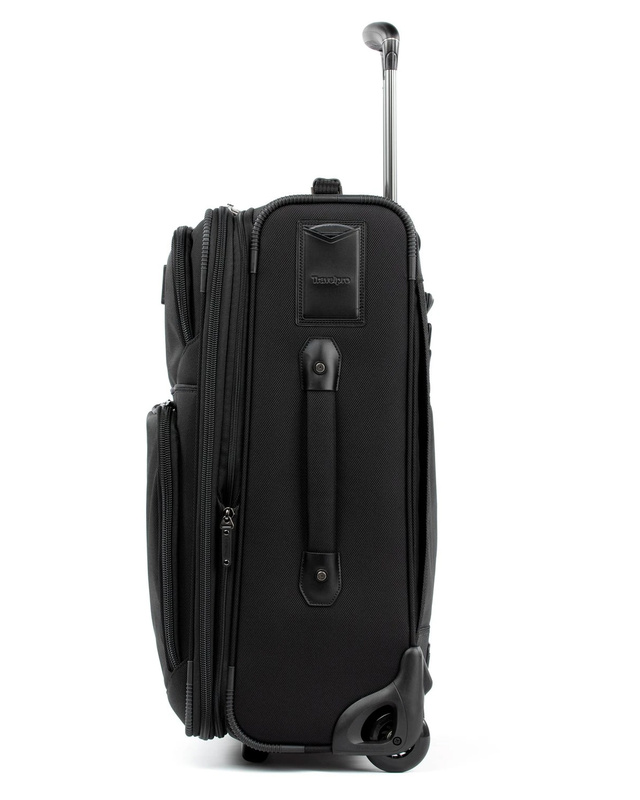 But if you want luggage that makes travel better than you could possibly imagine, buy this one.